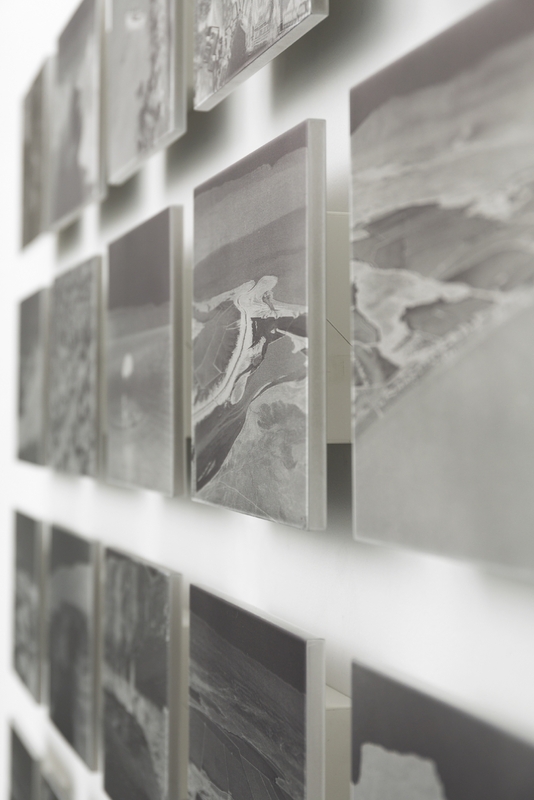 Description: A set of twenty photo etched negatives, laser embossed and etched on aluminium metal. The artworks titled Oblique Distance were produced by Axolotl as part of the closeupatadistance exhibition. closeupatadistance exhibition works approach topographically remote sites which engage and reverberate continually at extreme altitude or land depths, where social, cultural and environmental forces are enacted. Lynne Roberts-Goodwin engages with and speculates upon the contradictory imagining and imaging of disappearance and impact at sites along key ancient trade routes marked by environmental and geopolitical tension. Within this key series, closeupatadistance, the work collaboratively has engaged with the Dead Sea and surrounding contested sites of environmental and political impact from aerially oblique and ground positions. It is within these contested landscapes that narratives of migration, exile and the reverberation of aftermath are revealed. A poignant stillness, close up and at a distance, of unwritten bodies and vistas.